Hotel Elizabeth, originally named “Erszebet Szalo”, was built by Baron Armin Popper. It started its operations on January 1, 1902 and it immediately became part of the social and cultural life of the city of Trenčín. In 1921, the hotel was renamed “Hotel Tatra”. Nobility met here with perfect comfort and service of Viennese facilities. In 2006, SYNOT GASTRO SLOVAKIA, sro. became the new owner of the hotel. In 2010, extensive reconstruction, redevelopment and extension of the premises began, to make sure it will accommodate the needs to its guests with four star excellence and quality. All this was possible thanks to an investment of 13 million Euros, with substantial contribution by the European Union. 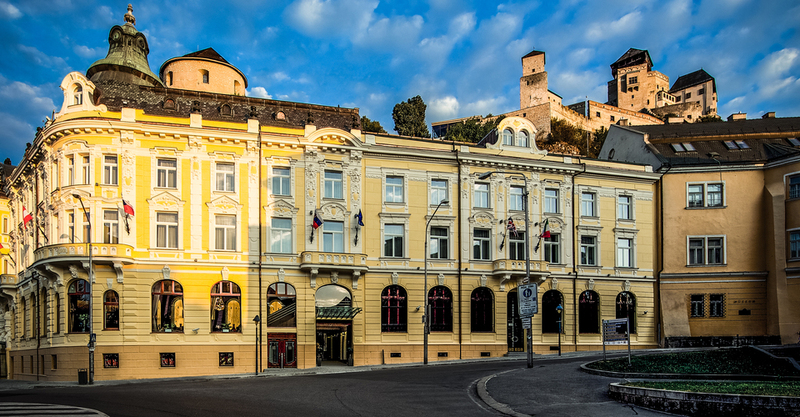 The historical Hotel Elizabeth is uniquely located directly below the medieval castle, in the centre of the City of Trenčín. Guests to the hotel may admire the nearly 2000 year old Roman Inscription on the castle rock from the hotel`s summer terrace.